When I was pregnant I would get a pedicure once a week. It just felt so good to have my feet and calves soaked and rubbed after carrying all that extra weight around all day. Well, I recently watched a 2020 on ABC news (http://abcnews.go.com/2020/video/risking-health-nail-salon-22822474) about the healthcare risks of nail salons. This intrigued me so I took my Mom for a pedicure today to see if my salon did any of the “no-no’s” ABC had reported. Well, most of them happened. They used a tool that is supposedly only for podiatrist. They filed my Mom’s nails with the same file they used on my nails without cleaning in between and so on and so on. I still love my nail salon and plan to go back, I think they are just as good as any nail salon. One of my mentors explains risks by the discussion of wearing your seat belt. Nine times out of ten you wear your seat belt and don’t need it, you would have been just as safe driving without your seat belt as you would with it as long as you don’t get in a wreck. But we all (most of us) wear our seat belts every time we get in the car because we don’t want to take the risk that this drive is going to be the time we get in a wreck. Most of us go to the salon because, much like not wearing our seat belt, we are taking the risk of nail trauma, damage and infections over the benefit of a good looking pedicure. Just like you usually don’t get in a wreck you usually don’t have problems with your nails after a manicure. Before you take these risks you should know exactly what they are. So in hopes to not scare you away from a good pedicure but educate you on what risks your taking, here are the things that you could get after a pedi and mani. 1. Beau lines- This is a transverse depression in the nail plate. Basically a line going across your nail. 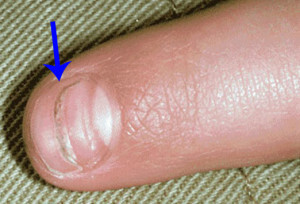 This can be caused by the trauma of a manicure, usually in one nail. If seen in all your nails you should see your dermatologist to check for underlying diseases that cause beau lines. 2. Acute Paronychia-This is an infection of the folds of tissue surrounding the nail of the finger that lasts less than 6 weeks. It usually starts as a red, swollen, tender area after trauma to the cuticle. 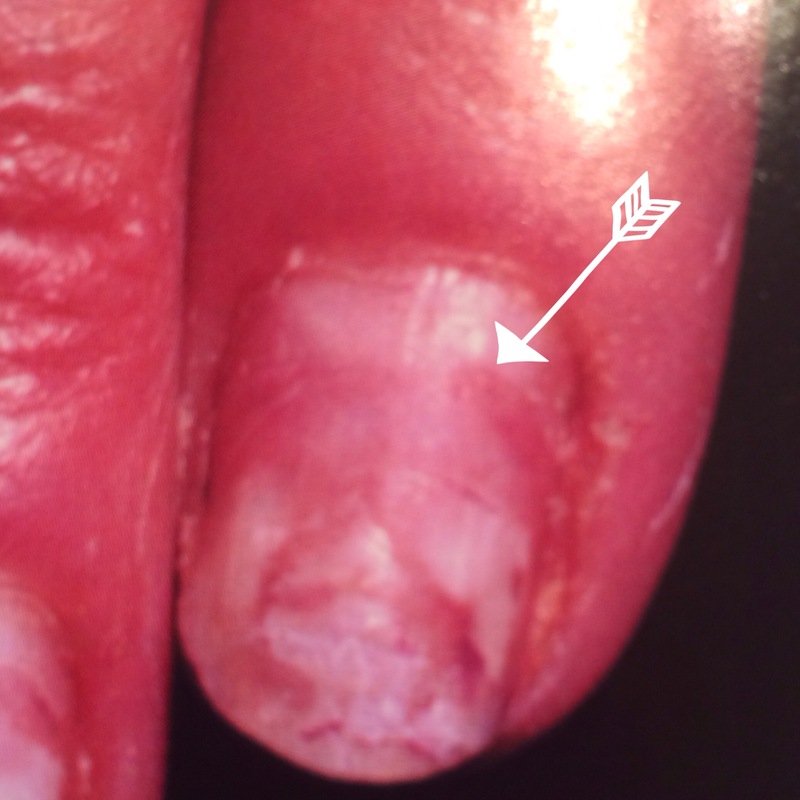 Trauma to the cuticle during a manicure can introduce bacteria and fungus. In the acute phase you may need drainage of pus or antibiotics from your dermatologist. 3. 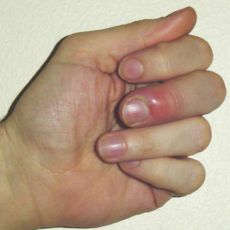 Chronic Paronychia- This infection lasts longer than 6 weeks and in chronic paronychia the nail plate separates from the cuticle leaving an area vulnerable to infection. In chronic paronychia the cuticle is gone. Among other causes this can be caused by aggressive trimming of the cuticles (like your nail lady may be doing). I never let them cut at my cuticles. Today the lady even said “but you have an ingrown toe nail that needs trimmed”. I just kept insisting she leave my cuticles alone (as if I couldn’t diagnose my self with an ingrown toe nail??). Diaper cream is a good over the counter treatment for this problem. 4. Leukonychia and onychoschizia- big fancy medical words used to describe what a chemically damaged nail looks like. 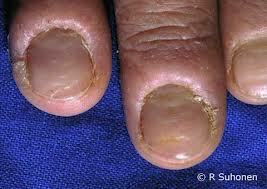 As you can probably guess, when we glue nails to ourselves those chemicals can damage and change the nail plate. Leukonychia is that white opaque discoloration and onychoschizia is splitting of the nail plate, basically your nail just looks jacked up. The arrow is pointing to where the damaged nail starts, you can see where healthy nail is starting to grow. 5. Athlete’s foot, MRSA and warts- While most of us probably come in contact with staph, fungus and hpv on a regular basis we are probably more likely to encounter these at the nail salon. Person to person spread is a no brainer but think about your own skin too. For instance, if you have a wart on your foot, that pumice stone rubbing all over the wart then causing tiny little cuts in your skin on the back of your foot, yes that could spread the wart virus and spread your warts, not cool. Cheers to good manicures and pedicures! I usually recommend keeping your nails trimmed to lessen the chance of injury. Keep them moisturized just like your skin and try to avoid harsh chemicals that can dry the nails. Hope to see all your nail probs this week at the clinic. Otherwise, stay nailtastic!